Secure your data on Facebook. You can Stop Facebook From Sharing Your Data with a 3rd Party. I have shared a method in which you put some restrictions on apps to get your personal information. You can restrict all the apps at once by changing your settings. It will automatically Stop Facebook From Sharing Your Data with a 3rd Party. It will not share any of your personal information with all these apps. Most of the applications on Facebook steals our precious data. This fraud is done under our supervision. You don’t believe me, right? Don’t worry I will tell you about this also. But, today our question is that how we stop Facebook from sharing your data with a 3rd party? It is a type of business which these third-party apps does on Facebook with our facebook account. Let’s move on to the next paragraph in which we will talk about the working of these apps. Do you want to know how a third party app access and share your data from Facebook? Then, this is for you. What happens is that suppose you tried to signup on a website using their Sign up with Facebook button. This Signup button is an app which is made on Facebook developer page for the variety of reasons. Now, it will ask you to grant the permission to access your bio, birth date, profile picture and lots more details. At that moment you will grant the permission for that. But, later on, that app will start sharing and stealing your data from your Facebook account to its data center. Thus, in this manner these apps works. Now, you know that how these apps work and how they steal our data from our facebook account. So, this time is to stop Facebook from sharing your data with a 3rd party. I will show you some easiest and straightforward method that will teach you to make your data safe from these kinds of apps. Just follow the below step by step guide and nothing else. 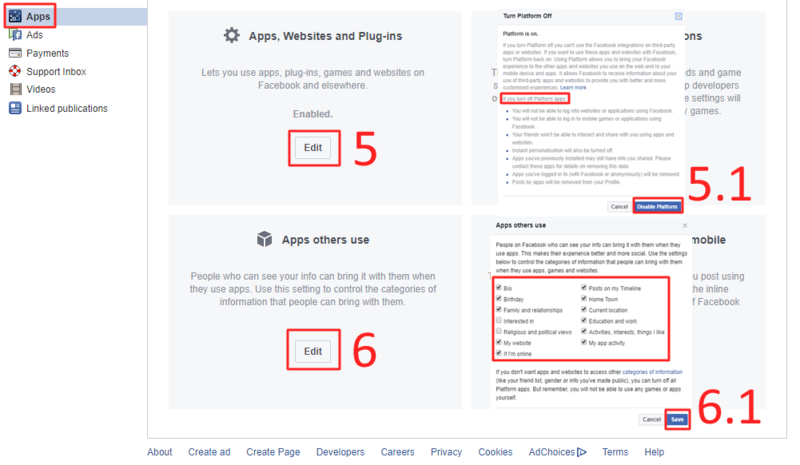 Now, go to the settings page of Facebook. From there, choose Apps option which is on the left side of that page. Now, you will see the Apps settings. 5.1 click Edit and then click Disable Platform. Similarly, in the Apps, others use tab click on Edit. 6.1 Then choose the category according to your wish which you want to share with apps. In this way, you can stop Facebook from sharing your data with a 3rd party. It is the best and easiest method which will save your data from being shared on Facebook with the third party. Make sure you use only trusted apps on Facebook. And click on apps present on the Facebook. Some apps may take you to an external website, So avoid these kinds of apps. Share this article with your friends also so that they can also stop Facebook from sharing their data with a 3rd party.